Bhubaneswar: With a view to woo the voters for the upcoming Elections, the Odisha Government today announced heavy allocation for its existing Welfare Schemes in the Vote-on Account presented today in the State Assembly. 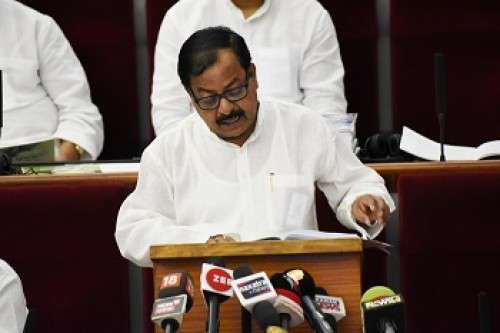 State Finance Minister Sashi Bhusan Behera presented the vote-on account with a proposed expenditure of Rs 56, 921 crore for the first 4 months of FY2019-20. “Keeping in view the requirement of funds for expenditure on payment of salary, pension, interest, old age pension, scholarship for SC and ST students, a sum of Rs 56,921 crore has been proposed in the vote-on-account for seeking approval of the August House to defray the expenses during the first four months of the financial year from April to July 2019,” said Behera. The government made highest allocation under KALIA (Krushak Assistance for Livelihood and Income Augmentation) scheme amounting to Rs 4461 crore. Rs 2935 crore was allocated under BASUDHA and Rs 1777 crore for Parbati Giri Mega lift irrigation project. Rs 1300 crore each was allocated for State road and Irrigation infrastructure development while Rs 1028 crore has been allocated for Re 1/kg rice. On the other hand, PEETHA got Rs 400 crore, Mission Shakti Rs 301 crore, Mamata Rs 305 crore and Biju Swasthya Kalyan Yojana Rs 864 crore. Odisha’s economy is expected to grow at the rate of 8.35 per cent in 2018-19 surpassing all India growth rate of 7.2 per cent. This comes on top of a robust average growth of more than 8 per cent in the last six years compared to the national average of about 7.1 per cent, said the Minister. Behera said going by the trends in the external and domestic economic environment, the state economy can be expected to grow in the range of 8 per cent to 8.5 per cent during 2019-20.